Congratulations WellPoint on entering into the precedent-setting accessibility agreement posted here. WellPoint is one of the nation’s leading health benefits companies, and this agreement will increase the accessibility and usability of WellPoint websites, mobile applications and print materials for plan members who are blind and visually impaired. WellPoint worked on this initiative with blind plan members Steven Mendelsohn and Sam Chen, and with the Law Office of Lainey Feingold and Linda Dardarian of Goldstein, Borgen, Dardarian & Ho in Structured Negotiations. This Settlement Agreement (“Agreement”) is entered into by and between Steven Mendelsohn and Sam Chen (collectively referred to as “Claimants”) and WellPoint, Inc., on behalf of itself and its affiliates (“WellPoint”) for the purposes and on the terms specified herein and operates in conjunction with the Confidential Addendum to this Agreement. Together Mendelsohn, Chen, and WellPoint are referred to herein as the Parties. Steven Mendelsohn is a resident of California, a Person with a Visual Impairment, and a person with a disability within the meaning of the Americans with Disabilities Act and the laws of the State of California. Claimant Mendelsohn has been a member of Anthem Blue Cross, a WellPoint affiliate, for many years. Claimant Sam Chen is a resident of California, a Person with a Visual Impairment, and a person with a disability within the meaning of the Americans with Disabilities Act and the laws of the State of California. Claimant Chen has been a member of Anthem Blue Cross, a WellPoint affiliate, for many years. WellPoint maintains websites for the convenience of the members of its Blue Cross Blue Shield Association licensed health plans (“Health Plan Members”) at anthem.com and anthem.com/ca. A dispute has arisen between Claimants and WellPoint concerning: (i) whether WellPoint is adequately providing Persons with Visual Impairments informational materials produced and distributed by WellPoint in formats that are effective for people who are blind or visually impaired; and (ii) whether WellPoint is adequately ensuring that the WellPoint Websites, as defined below, are accessible to Persons with Visual Impairments (“Accessible Information Dispute” or “the Dispute”). On or about April 22, 2011, Claimants notified WellPoint about the Dispute and offered to engage in Structured Negotiations, in lieu of litigation, to resolve the Dispute. In August, 2011, the Parties executed a Structured Negotiations Agreement to protect the interests of all Parties during those negotiations. Since executing that agreement, the Parties have engaged in good faith negotiations and shared relevant information regarding the Dispute. The Parties now enter into this Agreement to resolve the Dispute and to avoid the burden, expense, and risk of potential litigation. By entering into this Agreement, WellPoint does not admit, and specifically denies, that it has violated or failed to comply with any provisions of the ADA, any applicable laws of any state relating to accessibility for Persons with Visual Impairments, any regulations or guidelines promulgated pursuant to those statutes, or any other applicable laws, regulations, or legal requirements. Neither this Agreement, nor any of its Exhibits, Addenda, terms or provisions, nor any of the negotiations connected with it, shall be construed as an admission or concession by WellPoint of any such violation or failure to comply with any applicable law. This Agreement and its terms and provisions, including these Recitals and all Exhibits and Addenda, shall not be offered or received as evidence for any purpose whatsoever against WellPoint in any action or proceeding, other than a proceeding to enforce the terms of this Agreement and the Confidential Addendum executed herewith. Accessible PDF means a PDF document that satisfies WCAG 2.0 Conformance Level AA Success Criteria. Alternative Format(s) means Braille, large print, audio, and electronic formats as described in the Alternative Format Policy discussed in Section 6 of this Agreement and attached as Confidential Exhibit A to this Agreement. Claimants’ Counsel means Goldstein, Borgen, Dardarian & Ho and the Law Office of Lainey Feingold, and the attorneys practicing law therein. Customer Service Telephone means the customer service telephone numbers published by WellPoint in its marketing and member materials (e.g. member identification cards and the Contact Us page(s) of the WellPoint Websites). Effective Date means January 1, 2014. Person(s) with a Visual Impairment means any person who has a physical, mental or sensory impairment that substantially limits him or her in the major life activity of seeing. Third-Party Content means web content that is generated by a third party and not owned, coded, or hosted on WellPoint’s Websites. WellPoint Application(s) for Mobile Devices (or “WellPoint App”) means mobile applications published by WellPoint for the Health Plan Members. WellPoint Websites mean the consumer websites (including pages only available to WellPoint members) anthem.com and anthem.com/ca. The terms of this Agreement shall remain in effect through September 30, 2014. WellPoint will use best efforts to ensure that the WellPoint Websites substantially comply with the Web Content Accessibility Guidelines (WCAG) 2.0, Conformance Level AA Success Criteria (“Access Standard”), by March 31, 2014. The Parties acknowledge that some WCAG Conformance Level AA Success Criteria address features or design elements that may not be used on the WellPoint Websites, and in such circumstances compliance with those Success Criteria will not be required. If any Completely Automated Public Turing Test to Tell Computers and Humans Apart or similar visual or textual Turing or reverse-Turing verification test (referred to herein as “CAPTCHA”) is used on any WellPoint Websites, WellPoint will incorporate alternative security measures that are usable by Persons with Visual Impairments. PDF Documents on the WellPoint Websites. 3.3.1. WellPoint will use best efforts to ensure that all new PDF documents posted on the WellPoint Websites are Accessible PDFs. 3.3.2. Alternative Versions of PDF Documents on the WellPoint Websites. WellPoint will make non-accessible PDFs that were posted on the WellPoint Websites prior to August 2013 available in accessible format upon request, as provided in the Alternative Format Policy attached as Confidential Exhibit A to this Agreement. 3.4. Enforcement of Web Provisions. 3.4.1. 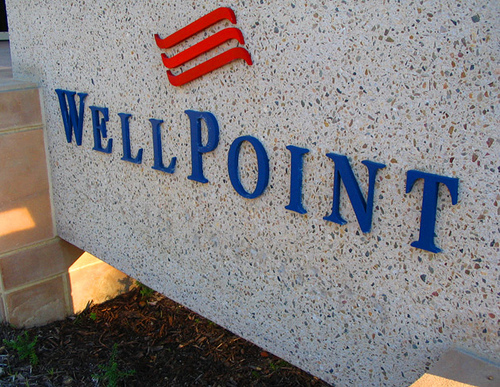 The procedures set forth below must be exhausted in the event that Claimants allege that WellPoint has failed to meet its obligations pursuant to Section 3 of this Agreement. Claimants shall not allege a breach of this Agreement in connection with such allegations until these procedures have been exhausted. 3.4.2. Claimants will notify WellPoint if they believe the WellPoint Websites do not meet the standards set forth in Section 3 of this Agreement. As soon as reasonably possible, but in no more than forty-five (45) days from receipt of Claimants’ notice, WellPoint will provide Claimants with: (1) notice evidencing current compliance with the applicable Success Criteria, (2) notice as to how and when WellPoint will meet the applicable Success Criteria, or (3) notice that WellPoint believes there is a Success Criteria with which it cannot substantially comply despite best efforts. 3.4.3. Within ten (10) days of Claimants’ receipt of WellPoint’s response, the Parties will meet by telephone in an attempt to informally resolve the issue. At Claimants’ request, the Accessibility Consultant(s) referenced in Section 5.1 of this Agreement will provide further explanation of the issue and information as to what would be required for the page or document at issue to satisfy WCAG 2.0 Level AA Success Criteria. 3.4.4. If the issue remains unresolved within 45 days of the telephone meeting, WellPoint will hire a mutually agreed-upon third party with web accessibility expertise (someone other than the Accessibility Consultant(s) defined in Section 5 of this Agreement) to provide an opinion on the issue within 30 days. Claimants shall allege no breach of this Agreement unless the third party expert determines that the challenged web page or posted document, or portion thereof: (a) does not substantially comply with the standards set forth in this Agreement; and (b) WellPoint fails to remedy the issue within sixty days of receiving the third party expert’s opinion. 3.4.5. Should the Parties have a dispute regarding an issue raised in a notice given under Section 3.4.2 of this Agreement, the dispute shall be handled pursuant to the procedures set forth in Section 10 of this Agreement. 3.4.6. Interim Measures. During the period in which the Parties are utilizing the procedures set forth in this Section 3.4, WellPoint will provide the information subject to dispute, provided it is not Third-Party Content, to a Person with a Visual Impairment, pursuant to the Alternative Format Policy. 3.5.1. Testing and Communications with Third Party Vendors. Periodically throughout the Term of the Agreement, WellPoint will test Third-Party Content on the WellPoint Websites to determine if it meets the Access Standard. Where WellPoint finds content that does not satisfy the Access Standard, or where Claimants notify WellPoint of such content, within thirty (30) days WellPoint will request in writing that the particular third party(ies) supplying that web content to WellPoint bring their content into conformance with the Access Standard. WellPoint will request that the vendors provide a written response within thirty (30) days. 3.5.2. If WellPoint is notified that a third party vendor will not bring its content into conformance with the Access Standard, WellPoint will use good faith efforts to find an alternative vendor that provides the content in compliance with the Access Standard, subject to WellPoint’s existing contractual obligations to the third party vendor. WellPoint will not be required to violate any confidentiality or non-disclosure agreements for any purpose or to terminate a pending third party vendor contract prior to its expiration date. 3.5.3. New Third-Party Content After the Effective Date. If, on or after the Effective Date, WellPoint issues requests for proposals for development or inclusion of Third-Party Content on the WellPoint Websites, or if WellPoint extends contracts for Third-Party Content existing as of the Effective Date, WellPoint will include compliance with the Access Standard as a requirement in all such requests for proposals and vendor contracts. WellPoint will use good faith efforts to select Third-Party vendors who can meet the Access Standard, in addition to other criteria in the request for proposals and vendor contracts. No later than March 31, 2014, WellPoint will develop an internal website accessibility policy that, at a minimum, will include: (i) a statement of the Access Standard and WellPoint’s commitment to use it; and (ii) protocols for testing and measuring accessibility of technology that is obtained from third party developers and vendors. WellPoint will provide Claimants with a draft of this website accessibility policy prior to its being finalized. Claimants will provide their feedback on this draft policy within fifteen (15) days of receipt, and WellPoint will consider the feedback provided by Claimants in good faith. 4. WellPoint Applications for Mobile Devices Accessibility Provisions. WellPoint will use best efforts to ensure that any WellPoint Applications for Mobile Devices substantially comply with the Access Standard by no later than June 30, 2014. The Parties recognize that some WCAG 2.0 Level A and AA Success Criteria address features or design elements that may not be used on WellPoint Applications for Mobile Devices and in such circumstances compliance with those Success Criteria is not required. The Parties also recognize that the accessibility of features used on WellPoint Applications for Mobile Devices are dependent on the operating systems of third parties, over which WellPoint has no control. 5. Accessibility Consultants, Usability Testing, and Compliance Tool. Web and Mobile Application Accessibility Expertise. During the term of this Agreement, WellPoint shall ensure that it has sufficient expertise to comply with the Access Standard, either by utilizing qualified in-house personnel whose experience has been shared with and found generally acceptable by Claimants, or by retaining an outside consultant who has been agreed to by Claimants to assist WellPoint’s principal web developers in ensuring substantial compliance with the Access Standard. 5.2.1. Usability Testing of WellPoint Websites. At least once before the date set forth in Section 3.1, WellPoint will ensure that the WellPoint Websites are tested by a cross-section of People with Visual Impairments and/or WellPoint technicians with Visual Impairments using various types of devices, assistive technology, browsers, and operating systems. WellPoint will also use reasonable efforts to ensure that any consumer focus groups convened to test products, services and content on the WellPoint Websites include at least one Person with a Visual Impairment. Throughout the Term of the Agreement, WellPoint will also consider feedback from Claimants regarding the accessibility and usability of the WellPoint Websites. 5.2.2. Usability Testing of Proposed Alternatives to Visual Verifications. If, during the term of this Agreement, WellPoint plans to include a new CAPTCHA on any of the WellPoint Website(s), it will provide a method for Claimants to test the alternative security measure to ensure that it is usable by Persons with Visual Impairments prior to the inclusion of the CAPTCHA on the WellPoint Website(s). WellPoint will also work with the Accessibility Consultant(s), or other mutually agreed on third party expert, to ensure that the usability of the alternative security measure is tested by a cross-section of People with Visual Impairments using different types of devices, assistive technology, browsers, and operating systems, prior to the inclusion of the CAPTCHA on the WellPoint Website(s). 5.2.3. Usability Testing of Applications for Mobile Devices. WellPoint will ensure that the usability of each release of a WellPoint Application for Mobile Devices is tested by a cross-section of People with Visual Impairments and/or one or more technician(s) with visual impairments using the device for which the Application is available. 5.2.4. WellPoint will give good faith consideration to all usability testing results and other feedback (collectively “feedback”) provided pursuant to Sections 5.2.1-5.2.3 and provided by Claimants and other Persons with Visual Impairments that is consistent with the terms of this Agreement. WellPoint will notify Claimants about its response to the feedback, and any disagreements regarding feedback will be treated as a dispute subject to the terms of Section 10 of this Agreement. WellPoint will continue, until the expiration of the Full Agreement, to use an automated compliance tool to help it assess accessibility issues on the WellPoint Websites. 6. Alternative Format for Print Information. No later than January 31, 2014, WellPoint will adopt and implement the Alternative Format Policy, attached hereto as Confidential Exhibit A, to provide for the delivery of alternative formats for print information (i.e., Braille, large print, and audio and electronic format) to Persons with Visual Impairments who are WellPoint’s commercial and Medicare Supplement members. The Alternative Format Policy is a corollary to policies and procedures already in place that are intended to provide for the delivery of alternative formats for print information to visually impaired members of WellPoint’s Medicare and Medicaid programs. 6.2. Information and Assistance Provided by WellPoint Telephone Staff. WellPoint will provide live assistance on a toll free telephone customer service line during its normal customer service operating hours to Persons with Visual Impairments. Customer service telephone staff will also accept feedback about the Alternative Format Policy. Upon request, telephone customer service staff will assist members who are Persons with Visual Impairments by reading WellPoint printed materials as set forth in Confidential Exhibit A, describing the Alternative Format Policy and procedure as set forth in Confidential Exhibit A, and providing additional information upon reasonable request. During the term of the Agreement, WellPoint will continue to evaluate the steps that would be necessary to enable it to flag member records to indicate that a member should receive all printed materials in a requested Alternative Format after the member’s initial request has been made. WellPoint will report on its evaluation and progress, and projected timetable for instituting a flagging system, at the meeting described in Section 8.1. 7. Accessibility Information Page on the WellPoint Websites. No later than March 31, 2014, WellPoint will post an Accessibility Information page on the WellPoint Websites. The page will include, at a minimum: (i) information regarding WellPoint’s efforts to meet the Access Standard on the WellPoint Websites; (ii) information regarding WellPoint’s efforts to meet the Access Standard for Applications for Mobile Devices, as applicable; (iii) information regarding use of the WellPoint Websites by Persons with Visual Impairments including usability tips; (iv) a description of the types of documents WellPoint makes available in alternative formats, the types of alternative formats available and the standards used for producing them, and the process for members and prospective members to request them; and (v) a web-based (or e-mail), and telephone-based method for Persons with Visual Impairments to contact WellPoint regarding accessibility concerns. WellPoint will provide Claimants with a draft of the Accessibility Information page(s) prior to its/their being finalized. Claimants will provide their feedback on this information within fifteen (15) days of receipt, and WellPoint will consider the feedback provided by Claimants in good faith. The Accessibility Information Page(s) will, at a minimum, be available from a link on the footer of the home pages of the WellPoint Websites and all pages where the footer appears. It will also be listed as a help topic on all WellPoint Websites’ Help pages. 8. Meetings Regarding this Agreement. On a mutually agreed upon date during the Term of this Agreement, the Parties will meet by telephone to discuss any issue concerning implementation of this Agreement. Upon reasonable request of Claimants, WellPoint will invite one or more of its Alternative Format vendor(s), as appropriate, to participate in the meeting, and will provide Claimants with a list of any documents that WellPoint determined could not be produced in a requested alternative format because production would result in an undue burden. WellPoint will use best efforts to track all feedback it receives via email, telephone customer service, and the WellPoint Websites from Persons with Visual Impairments regarding the issues addressed in Sections 3, 4, and 6 of this Agreement and to mitigate any accessibility barriers that might be identified. 9. Training of WellPoint Staff. To ensure effective implementation of this Agreement, WellPoint will provide training to designated staff as set forth in this Section. 9.1. Telephone Customer Service Staff. WellPoint will provide training on the following subjects to designated telephone customer service personnel who answer inquiries from members and the general public about plan and benefit information: (i) appropriate techniques for reading documents to Persons with Visual Impairments effectively, accurately, and impartially, and using any necessary specialized vocabulary; (ii) the Alternative Format Policy; (iii) procedures for receiving and processing requests for Alternative Formats; (iv) informing WellPoint members and other members of the public about the availability of Alternative Formats as set forth in the Alternative Format Policy; (v) how to handle complaints regarding Alternative Formats; (vi) how to route calls concerning accessibility issues on the WellPoint Websites and Mobile Applications; and (vii) appropriate communications with Persons with Visual Impairments. 9.2. Technical Support Telephone Staff. WellPoint will provide training on the following subjects to designated personnel who answer customer calls and provide information concerning website technical support and accessibility issues: (i) the types of assistive technology used by web users who are Persons with Visual Impairments; (ii) the fact that many visually impaired computer users rely solely on a keyboard, and do not use a mouse, to navigate a website; (iii) the existence and content of the Accessibility Information Page; and (iv) internal WellPoint procedures for addressing web and mobile accessibility complaints. 9.3. Web and Mobile Application Development Staff. WellPoint will provide accessibility training for all WellPoint employees responsible for ensuring that the WellPoint Websites and Mobile Application meet the Access Standard. WellPoint will train appropriate staff in a timely manner on the topics identified in Sections 9.1 – 9.3. WellPoint will provide refresher training as reasonably necessary and will train new staff on these topics upon initial hire. WellPoint will make a good faith effort to ensure that at least part of the training described herein is provided by a qualified Person with a Visual Impairment. WellPoint will provide Claimants with a copy of the training materials. Claimants will provide their feedback on the training materials within fifteen (15) days of receipt, and WellPoint will consider the feedback provided by Claimants in good faith. 10. Procedures in the Event of Disputes. If a Party believes that any other Party has not complied with any provision of this Agreement, that Party shall provide the other Party with Notice of Non-Compliance containing the following information: (i) the alleged act of non-compliance; (ii) a reference to the specific provision(s) of the Settlement Agreement or Confidential Addendum that are involved; (iii) a statement of the remedial action sought by the initiating party; and (iv) a brief statement of the specific facts, circumstances and legal argument supporting the position of the initiating Party. Within thirty (30) days of receipt of a Notice provided pursuant to Section 10.1, the non-initiating Party shall respond to the initiating Party in writing. If the matters raised in a Notice provided pursuant to 10.1 are not resolved within forty-five (45) days of the initial meet and confer required by Section 10.3, either Party may submit the unresolved matters to nonbinding mediation before a mutually agreed upon mediator affiliated with Judicial Arbitration & Mediation Services (“JAMS”), or such other mediator as the Parties may jointly designate. If mediation fails to resolve the matter, the Parties then will settle the matter finally by means of arbitration conducted by JAMS pursuant to its Streamlined Arbitration Rules and Procedures at a mutually convenient location. The award of the arbitrator will be enforceable in a court of competent jurisdiction. During the period in which the Parties are utilizing the procedures set forth in this Section 10, and provided that the information subject to dispute is not Third-Party Content, pursuant to Alternative Format Policy WellPoint will provide the information subject to dispute in an accessible format, including Braille, large print, audio, or electronic formats or through a Qualified Reader, to a Person with a Visual Impairment upon request. 11. Notice or Communication to Parties. 12. Publicity Regarding This Agreement and Its Terms. The Parties will issue the press release attached hereto as Exhibit B on or around January 13, 2013. 13. Agreement Binding on Assigns and Successors; No Third Party Beneficiaries. This Agreement shall bind any assigns and successors of WellPoint. Within thirty (30) days of assignment or succession, WellPoint shall notify Claimants in writing of the existence, name, address and telephone number of any assigns or successors relating to the subject matters addressed herein. 13.2. No Third Party Beneficiaries. This Agreement is for the benefit of the Parties hereto only and no other person or entity shall be entitled to rely hereon, receive any benefit herefrom, or enforce against either party any provision hereof. The Parties specifically intend that there be no third party beneficiaries to this Agreement. The performance of WellPoint under this Agreement shall be excused during the period and to the extent that such performance is rendered impossible, impracticable or unduly burdensome due to acts of God, strikes or lockouts, unavailability of parts, equipment or materials through normal supply sources, security threat, or any other event of force majeure. If WellPoint seeks to invoke this Section as the result of an event of force majeure it shall notify Claimants in writing as soon as reasonably practicable, specifying the particular action(s) that could not be performed and the specific reason for non-performance. Claimants’ Counsel and WellPoint will thereafter meet and confer regarding an alternative schedule for completion of the action that could not be performed, or an alternative action. Any dispute regarding the applicability of this Section, or any future action to be taken, that remains after the meet and confer session will be handled as a dispute pursuant to Section 10 of this Agreement. The terms of any Recital or any Exhibit attached hereto are fully incorporated into this Agreement and are an integral part thereof. The terms of this Agreement, where applicable, are fully incorporated into all Exhibits and are, where applicable, an integral part thereof. The use of the term “Agreement” herein includes all Exhibits. 16. Multiple Originals/Execution in Counterparts. Each Party and Claimants’ Counsel shall sign one copy of this document and each such copy shall be considered an original. This document may be executed in counterparts and facsimile and PDF signatures shall be accepted as original. WellPoint is one of the largest health benefits companies in the United States. It operates many Blue Cross companies. This post is the agreement that WellPoint signed about giving information to blind members. WellPoint will make its website easier for people with disabilities to use. WellPoint will use international standards to make sure its website works for everyone. WellPoint will also offer print information in formats that blind people can read. These include braille, large print, audio and electronic. Back to Agreement.